The United States Mint has confirmed the upcoming availability of the 2010 Proof American Silver Eagle on November 19. This offering will follow the 2010 Proof Gold Eagles, scheduled for release later this week on October 7. Proof Silver Eagles are the collectible versions of the silver bullion coin. The coins have traditionally been offered each year by the United States Mint, however, high demand for bullion coins led to a disruption of the series last year. 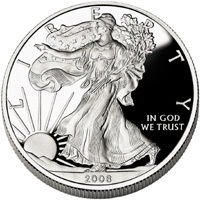 The 2009 Proof Silver Eagle was announced canceled almost one year ago, to the date. The US Mint had cited the unprecedented demand for gold and silver bullion coins as the reason for the cancellation. By law, the Mint is required to produce American Eagle bullion coins in quantities sufficient to meet public demand, whereas no legal requirement exists for the collector versions of the coins. A recent pull back in the demand for Silver Eagle bullion coins combined with the increased supply of silver planchets that the US Mint has been able to obtain from suppliers helped prevent another cancellation for this year’s offering. Efforts were also underway to amend the law relating to Silver Eagle production, to allow collector versions to be struck even if full demand for bullion coins remained unmet. The 2010 Proof Silver Eagle will be priced at $45.95 each. This represents an increase in price of $14.00 compared to the 2008 Proof Silver Eagle. The US Mint will impose an ordering limit of 100 units per household. I am excited that the mint is finally offering proof silver eagles again. I wonder if we have any idea on mintages?? Also, I think the date for gold proof eagles should say October 7th. Thanks. There was something about 200,000 a month. So 600,000~ max. a slightly low run. There was something about 200,000 a month. So 600,000~ max. a slightly low run. Oh, received mint subscription notice today to verify info for shipping on release. I have a subscription for the proof silver eagle that was processed on November 8th. Today I got an email saying the 2010 proof silver eagle was sold out and my order was cancelled. I wonder if there will be an opportunity to again order the proof silver eagle on November 19th? By phone inquiry, the Us Mint is stating that subscriptions were canceled in error and will be reinstated. I am awaiting a statement from the Mint to confirm.